Hiring of Three (03) Coasters and Six (06) Hiace for Pick and Drop of CAA employees from Islamabad/Rawalpindi to Islamabad International Airport. 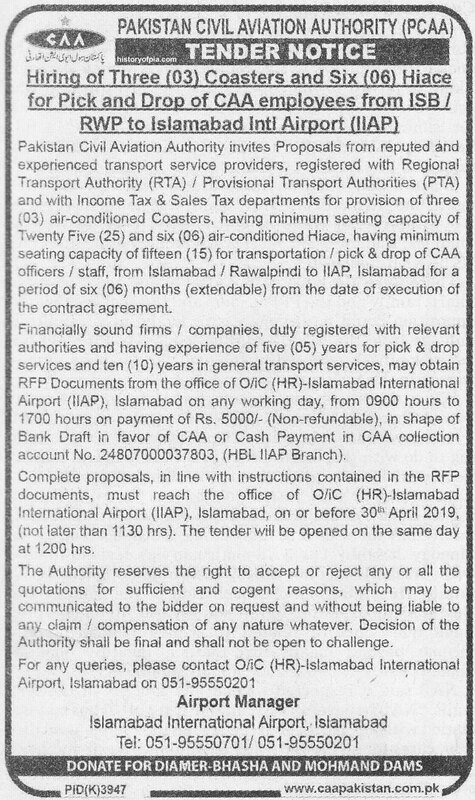 Pakistan Civil Aviation Authority (CAA) invites proposals from reputed and experience transport service providers, registered with Regional Transport Authority (RTA)/Provincial Transport Authority (PTA) and with Income Tax & Sales Tax departments for provision of three (03) air-conditioned coasters, having minimum seating capacity of twenty-five (25) and six (06) air-conditioned Hiace, having minimum seating capacity of fifteen (15) for transportation/pick & drop of CAA officers/staff, from Islamabad/Rawalpindi to Islamabad International Airport, Islamabad, for a period of six (06) months (extendable) from the date of execution of the contract agreement. RAWALPINDI: Due to shortage of transport facilities, the Civil Aviation Authority (CAA) has decided to hire nine private passenger coaches to pick and drop its employees working at the Islamabad International Airport (IIA) from Rawalpindi and Islamabad. The decision to hire three air-conditioned 25-seat coasters and six air-conditioned wagons with the seating capacity of 15 was taken after the employees took up problems being faced by them on reaching the airport timely and back home with the higher authorities. A CAA official said the nine coaches would be used to pick and drop the CAA employees from Rawalpindi and Islamabad. He said the CAA officers were given Rs2,000 and low grade employees Rs1,000 per month as travelling allowance. But this amount was insufficient to meet the transportation cost. He said the CAA had its own buses but these were not sufficient to cater to the employees and always remained packed with people, making it impossible for women employees even to board them. A female employee of the CAA told Dawn that though she had been using a transport vehicle of the CAA but it was in a poor condition and needed an urgent maintenance. Therefore, she said, she had no other option but to travel on a bus or wagon with other employees. `It is tortuous to stand on the roadside and wait for a taxi or ride sharing facility,` said an airline employee. He said a large number of employees and other private workers could be seen standing on the roadside outside the airport daily and waving to private vehicles and bikes for a lif t as they can`tafford hiring taxis. The airline employee said even almost a year after the greenfield IIA was made operational by the previous PML-N government there was no transport facility to and from the airport for the employees, passengers and other visitors. The previous government had planned a metro bus service from Islamabad to the new airport but the project is far from completion as work on it is moving on a snail`s pace. A frequent traveller to the airport said the government should at least arrange coasters or wagons for the airport employees so that they could reach on duty on time and return home with ease. He suggested to the authorities of the district administration of Rawalpindi and Islamabad and the Regional Transport Authority to once travel to and from the new airport without protocol so that they could realise the difficulties being faced by the employees and the citizens.